Double Teenage is about the two lives of young white American girls growing up in the desert in New Mexico. The horizon stretches out for Celine and Julie; a hazy, dusty landscape where their parents had come to build new lives. 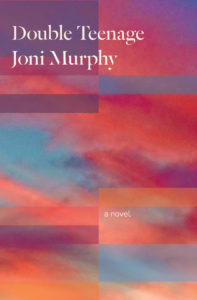 Joni Murphy’s book is attuned to the politics of race and class, and from the beginning her assured, controlled style situates us within the nexus of capitalism and class, white privilege, and gender violence. Colonialism, white settlers, middle-class aspirations, American military expansion and might; these are the building blocks on which suburban white aspirations in New Mexico are founded, regardless of whether its members identify with the values of American exceptionalism, or, like Celine’s mother, disavow them and chafe at the injustice of it all. On the horizon, along with the desert, there is the tinge of danger that Celine and Julie grow up learning about. This is a danger that continually surrounds them. The specter of violence against women meted out against the bodies of working-class brown women in Ciudad-Juárez is the specter that haunts this book, and Celine and Julie’s consciousness. Joni Murphy’s book is interested in these questions; it is unabashedly intelligent and unafraid of where these queries might go. It’s a book that wears a sense of responsibility about both its white female subjects and the numerous women, all over North America, who meet an end at the hands of men: many of whom are not white, not middle-class, and therefore outside of the scope of Celine and Julie’s experience. From the start it is clear that this is not a novel that wants to focus on character or plot development or tell a story; rather, it’s about the social and political forces that shape Celine and Julie’s lives and the lives of women they know, and an attempt to highlight the material forces that shape lives more than individual agency and will. For this reason, Murphy has structured her book to allow for room. It allows difficult questions to assert themselves and remain unanswered. Although ostensibly about the friendship between two girls, and a typical bildungsroman in one sense, it’s a bildungsroman about girlhood in late capitalism, and it is necessarily fractured, episodic, dream-like. The early sections read like a realist novel, with straightforward narratives of the girls’ lives. In their experimentation with drugs, boys, and theater, and the proximity to the gendered violence (the girls grow up with the knowledge of women’s deaths at the hands of men), the girls begin to question the link between what and how they know things, and how their lives are lived. The problem of girlhood, going beyond the scope of Celine and Julie’s race and class position, cannot be adequately addressed within the form of literary realism. Murphy is not simply interested in telling a story, but making an inquiry. As such, the later sections of the book become abstract, theoretical. It zooms out of Celine and Julie’s immediate experience in an attempt to synthesise it with what the girls come to learn and know about politics, gender, and sexuality. Structuring the book in this way allows Murphy to write about middle-class white girlhood without making middle-class white girlhood the epitome of girlhood. It does not universalise whiteness even if it comes from that perspective. Double Teenage does not simply situate all of female experience within Celine and Julie’s experience. It is attentive to its responsibility to something more than its fictional characters. This is the trap of a conventionally-told story that adheres to the form of literary realism. Double Teenage is an attempt to avoid that. There is no outside of Celine and Julie, in a realist novel. The characters’ incomplete experience will necessarily come to represent the whole. White writers who write in this manner will necessarily have to deal with the question of white privilege; if whiteness structures your characters’ lives, and whiteness is so often taken as the default mode of humanity, and how can you claim to speak of girlhood in the general when it is filtered through such a particular identity? Murphy’s formal experimentation is an attempt not to bypass that question, but to deal with its limitations. As the girls correctly recognize, social relationships in late capitalist societies are deeply alienated: “Estrangement seems to be an epidemic.” But the hunger cannot be abated: “The girls yearn for unmediated, alive connections.” It would seem that what was most alive for them was their friendship, but they can never go back to that unmediated state of connection when they were girls. That doesn’t stop Julie from writing to Celine, anyway, remembering a time when Celine “pulled a box of sparklers from [her] purse and we wrote a cursive message in explosive ink against the dark.” This is what is crucial to Julie, in her attempt to connect with Celine: “I don’t know what you were writing, but I wanted you to know what I was.” Resisting the conventional scripts of girlhood, Julie writes to define herself. In that way, Double Teenage is also an attempt to articulate a space for girlhood that doesn’t fix girls as either doomed or desirable, or both.